The air temperature is not greater than 10°C (50°F) for more than one-half of any 24 hour period. When concrete is being managed under cold weather, it must be protected from freezing shortly after being poured. Also concrete must be able to develop the required strength for the safe removal of forms while reducing the circumstances where excessive heat must be applied to help concrete develop the required strength. Other important factors that must be considered are the proper curing conditions that prevent cracking and provide the intended serviceability of the structure. Follow these recommended steps to assure that concrete in cold weather will obtain the required design strength and that you don't have any other issues while the concrete is setting. Prior to pouring, define the strategies that will be used including materials, forms, testing, and other requirements. Schedule and determine the cold weather protection measurement of the concrete mix. Keep a well-defined temperature record chart including concrete temperature and exterior temperature. Never pour concrete over frozen ground, snow, or ice. Use heaters to thaw the ground before pouring concrete. Determine if special considerations and strength requirements must be met; if so, protect concrete at specific temperatures. If heated enclosures are going to be used when placing concrete in cold weather, be sure to know that they must be windproof and weatherproof. If combustion heaters are used, vent outside to prevent carbonation. Cold weather concrete should have the correct amount of air entrained voids that will resist freezing and thawing effects. Concrete in cold weather is recommended to have a low slump, and minimal water to cement ratio, to reduce bleeding and decreases setting time. Use concrete curing blankets to prevent freezing and keep the concrete at an optimal curing temperature. Use insulation blankets or heated enclosures to maintain concrete temperatures above 50° degrees Fahrenheit for three to seven days. Do not begin final finishing operations while bleed water is present. Request a heated mix or order 100 lbs. of extra cement for each cubic yard of concrete. This extra cement helps develop early strength. Fresh concrete frozen during the first 24 hours can lose 50% of its potential 28-day strength! Maintain the concrete temperature above 40° degrees Fahrenheit for at least four more days after the use of the insulation blankets or heated enclosures. Be careful!! The concrete temperature cannot drop more than 40° Fahrenheit in 24 hours. When there is no other option, adding a cement bag to the mix will help. Do not seal freshly placed concrete until it has bleed and the setting process has begun. It is recommended to place concrete as soon as possible, if the batch plant is too far from the concrete’s final destination, additional steps must be taken to reduce setting problems. Hot water heaters might not be able to withstand hotter temperatures after the initial batches. Temperatures for placement and protecting concrete in cold weather are established and mandated under ACI 306. The objective of the ACI 306 is to keep concrete warm, over 5 degrees Celsius, for the first 48 hours, where concrete strength development is critical. When concrete is being placed below 5 degrees but is not below freezing point, concrete will take longer to develop the required strength. 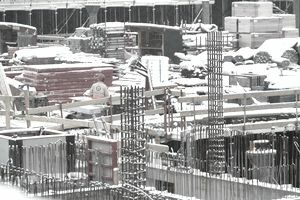 Note that removing formwork when concrete is too cold or hasn’t reached desired strength, could damage concrete strength and surfaces and concrete might collapse. Using frost blankets and insulated formwork could be necessary to protect concrete. Insulated forms or temporary covers could provide sufficient insulation in beams, columns, and walls.